Investigate the performance of a selected small business enterprise.J&amp;S furniture is a furniture manufacturing company owned by two brothers John and Smith. 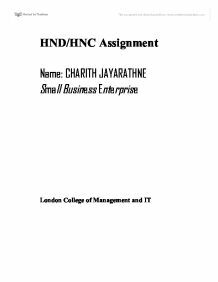 HND/HNC Assignment Name: CHARITH JAYARATHNE Small Business Enterprise London College of Management and IT 1. 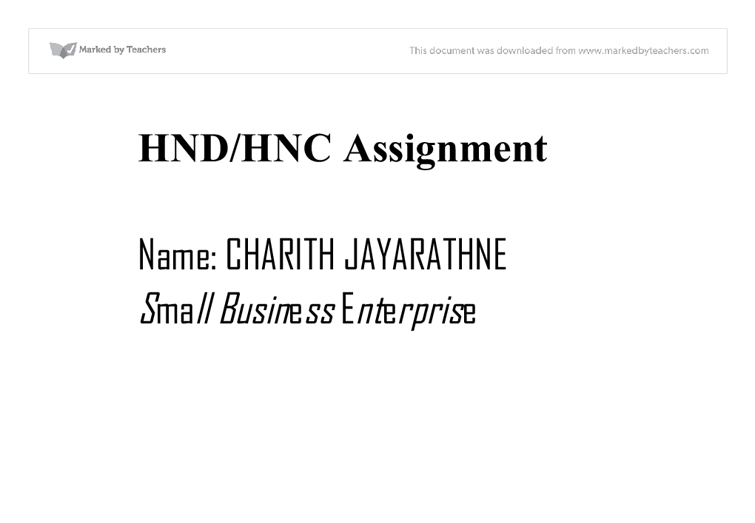 Investigate performance of a selected small business enterprise. 1.1 J&S furniture is a furniture manufacturing company owned by two brothers John and Smith. J&S started operations in 2006 and there is a satisfactory growth in this business since then. However there are fall in turnover in some months as well. J&S import wood from Asian countries and manufacture furniture. Company had been able to get massive discounts from its suppliers because of bulk buying so this had helped them to keep their cost under control. However government policies such as taxes on imports, interest rates and exchange rates have had negative impact on this business. Taxes on imports Since UK government is taxing heavily on imports from non EU countries this had affected J&S a lot therefore now J&S is looking whether they can find out a cheaper supplier from UK or EU. Interest rates Recent increase in interest rates affected J&S's profit margins. So J&S is thinking of increasing the price but if they increase the price the demand may fall. Exchange rate J&S is purchasing raw materials overseas and recent depreciation in pound had a negative impact on its cost of production. ...read more. Since internet has a global reach J &S should advertise in the internet because it will help them to increase their market share. J &S should carry out a market research and find out customer's needs and give offers according to their needs. If this approach is used J &S can maximize its sales revenue in all the branches. 3. Revise business objectives and plans to incorporate proposed changes. 3.1 Since UK is in a economic crisis company is planning to open up at least two branches in another EU country such as France and Germany in order to increase the market share and spread the risk J &S is planning to fund these new projects from their retained profits. Action plan 1st Nov 2008- Have a meeting with all the partners and discuss their opinions in order to do necessary amendments to the plan. 15th Nov 2008- Explain the workers about the new project and make them understand the benefits of this. 31st Nov 2008-Examine the new market and identify the needs of the new customers. 15th Dec 2008-Contact the suppliers and order the raw materials needed for the products. 1st Jan 2009- Open up only one new branch. 1st June 2009-Compare the actual results of the new shops with budgeted figures of the first six months if they are achieved the targets that means the company is functioning well If not amend the plan according to the changing market conditions. ...read more. J&S will become less competitive in the market, consequently volume of sales will fall therefore inflation affect sales. From the above egs. we can see that changes in economic factors may have favorable or adverse impact therefore it is necessary to constantly monitor changes in the economic factors. Technological factors Changes in technology may have an impact on the business. Technology has changed how services are provided to customers. Increase in internet hade enabled People from other countries to Visit J&S website and submit applications. This will help J&S to attract more customers. J&S use latest technology replacing paper communication thereby LCMIT have been able to show better results by using better technology. 3.3 Once the new branch is opened J&S needs to monitor its performance regularly .One method is to compare its performance against its branches in London. So that any loop holes can be identified and will be able to performance better and improve sales in the future. If the company does not practice bench marking there is a chance that it can become over confident and this will be the downfall of the company. If bench marking is done this will not happen. Budgeting helps management to plan and control its activities and it is a tool of control. Company should investigate the causes of the various variances and take remedial actions if there is an adverse variance. ...read more. there are two types of outputs, services and products. Services and intangibles you cannot see, touch or feel, services include education, health care, transportation. The issues with services are you may not know what you are getting into when purchasing. For example, when you pay for a massage, it is purely on what you expect to receive. > Sampling events at Trung Nguyen's coffee shop owned or franchise by Trung Nguyen's coffee. This kind of sampling should be used to show the distinct relative advantages of the fresh coffee of Trung Nguyen coffee. In addition, premium should be offered in some period when introducing a new coffee product. This question is very important to know my best time of the day during opening hours. I have asked these people what type of food or cuisines they prefer. 12 people prefer English food, 10 people for Oriental cuisines, 5 people for Continental dishes and 2 for other type of cuisines. most importantly the ability to close a sale or sense whether or not the consumer is not interested in making a purchase. . Administration Good administration is an integral part of an efficient and productive business. Administration deals with the accurate and efficient organisation of documents, files, business correspondence, invoices and reminders for payments etc. 'Try' cards outline simple but effective ways for customers to make small but significant changes to the food they eat. The campaign, promoted in stores, newspapers, magazines and on TV, has been hugely successful, with over 7 million 'Try' cards picked up in stores. The way they present their homepage will give the audience an insight what they expect to see. For example on their homage they may have a good looking model dressed nicely in New look clothing and as result the customers may be visually captured by and then check out the whole online site.